The value judgements that policymakers express when justifying their agendas to legislatures and the public. The enduring impact of these value-driven policies beyond the terms of single elections (and often long after they have left office). Schneider, Ingram and Deleon identify the importance of this process in three main steps. First, when competing for elected public office, people articulate value judgements and make fundamental choices about which social groups should be treated differently by government bodies. They present arguments for rewarding ‘good’ groups with government support and punishing ‘bad’ groups with sanctions. This description, which may seem rather simplistic, highlights the tendency of policymakers to make quick and superficial judgements, and back up their impressions with selective facts, before distributing rewards and sanctions. There is a crucial ‘fast thinking’ element to policymaking. Policymakers make quick, biased, emotional judgements, then back up their actions with selective facts to ‘institutionalize’ their understanding of a policy problem and its solution. Second, these judgements can have an enduring ‘feed-forward’ effect: fundamental choices based on values are reproduced in the institutions devoted to policy delivery. Policy designs based on emotionally-driven thinking often become routine and questioned rarely in government. Third, this decision has an impact on citizens and groups, who participate more or less in politics according to how they are characterised by government. Some groups can become more or less powerful, and categorised differently, if they have the resources to mobilise and challenge the way they are perceived by policymakers (and the media and public). However, this outcome may take decades in the absence of a major event, such as an economic crisis or game-changing election. Overall, past policies, based on rapid emotional judgements and policymakers’ values, provide key context for policymaking. The distribution of rewards and sanctions is cumulative, influencing future action by signalling to target populations how they are described and will be treated. Social constructions are difficult to overcome, because a sequence of previous policies, based on a particular framing of target populations, produces ‘hegemony’: the public, media and/ or policymakers take this set of values for granted, as normal or natural, and rarely question them when engaging in politics. SCTP builds on classic discussions of power, in which actors exercise power to reinforce or challenge policymaker and social attitudes. For example, if most people assume that people in poverty deserve little government help, because they are largely responsible for their own fate, policymakers have little incentive to intervene. 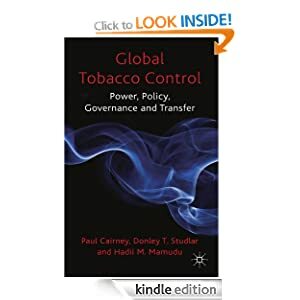 In such cases, power and powerlessness relates to the inability of disadvantaged groups to persuade the public, media and/ or government that there is a reason to make policy or a problem to be solved. Or, people may take for granted that criminals should be punished because they are engaging in deviant behaviour. To challenge policies based on this understanding, groups have to challenge fundamental public assumptions, reinforced by government policy, regarding what constitutes normal and deviant behaviour. Yet, many such groups have no obvious way in which to mobilise to pursue their collective interests. SCTP depicts this dilemma with a notional table (page 102) in which there are two spectrums: one describes the positive or negative ways in which groups are portrayed by policymakers, the other describes the resources available to groups to challenge or reinforce that image. The powerful and positively constructed are ‘advantaged’; the powerful and negatively constructed are ‘contenders’; the powerless and positively constructed are ‘dependents’; the powerless and negatively constructed are ‘deviants’. As such, the table represents an abstract account of policymaking context, in which some groups are more likely to be favoured or stigmatised by government, and some groups are better able to exploit their favourable, or challenge their unfavourable, image. 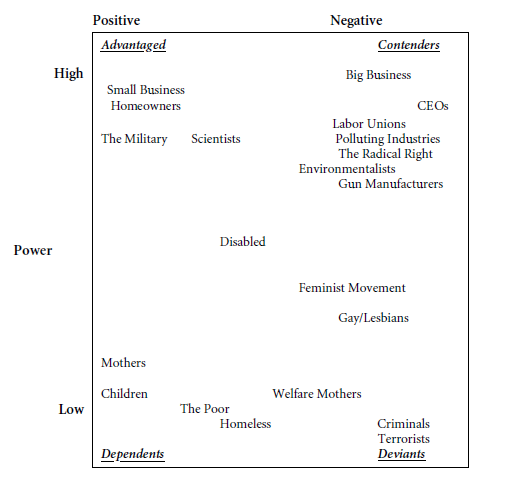 It represents the starting point to empirical analysis since, although some examples seem intuitive (many ‘criminals’ are punished by government and have minimal ways in which to mobilise to influence policy), many are time-specific (the ‘feminist movement’ has been more or less active over time) and place-specific (gun manufacturers are high profile in the US, but not the UK). Different populations are also more or less favoured by policymakers at different levels of government – for example, ‘street level’ professionals may treat certain ‘deviant’ populations, such as intravenous drug users, more sympathetically – and may, for example, find it easier to mobilise at local than national levels. Further, people do not fit neatly into these categories – many ‘mothers’ are also ‘scientists’ and/ or part of the ‘feminist movement’ – and may mobilise according to their own perception of their identity. 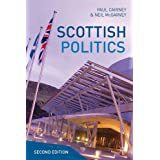 Still, SCTP demonstrates that policymakers can treat people in certain ways, based on a quick, emotional and simplistic understanding of their background, and that this way of thinking should not be forgotten simply because it is taken for granted. 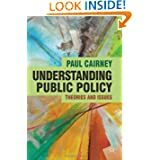 Indeed, governments may go one step further to reinforce these judgements: capitalising on ‘fast thinking’ in the population by constructing simple ‘narratives’ designed to justify policy action to a public that may be prone to accept simple stories that seem plausible, confirm their biases, exploit their emotions, and/ or come from a source they trust. Actors compete to tell ‘stories, to quickly assign blame to one group of people, or praise another, even though that group is heterogeneous and cause/effect is multifaceted. The winner of this competition may help produce a policy response which endures for years, if not decades. Who are the most deserving and entitled to government benefits?